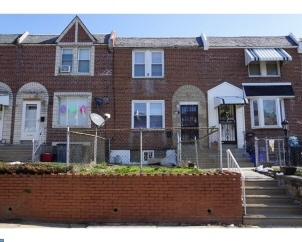 Description: Remodeled 3 bed 1 1/2 bath Mayfair row home featuring fenced front yard with patio and brick retaining wall. Enter the home through the ornamental iron screen door to the large living room and dining room all freshly painted and carpeted. Wall unit air conditioning built into the dining room wall. Newer remodeled kitchen with gas range, stainless sink, refrigerator, oak cabinetry and range hood. Large finished basement with powder room, wet bar and converted garage for a larger family room with recessed lighting. Basement laundry area with exit to rear driveway for off street parking with partial garage storage with newer garage door. The 2nd floor features master bedroom, remodeled 3 piece ceramic tile hall bath with skylight and 2 other good sized bedrooms. Newer windows throughout, new interior doors throughout. Forced hot air gas heat and circuit breaker electric. Ready to move right in. Schedule your appointment today!